China's slower economic data points and a surplus in copper and iron ore drove many commodities lower this week, while gold rose. In the short term, until the copper and iron ore surplus is liquidated, or absorbed at a slower pace, the base metals market will likely be sloppy. As the second-largest economy in the world and a huge driver of commodities demand, it's not surprising China provoked such a significant response from world markets. Interestingly, most of the media thought it was geopolitical fears from Ukraine that chopped up the market and lifted gold. Over the past few decades, we've watched the country experience tremendous economic growth, with its share of world GDP growth going from only 1.4 percent in 1992 to nearly 20 percent two decades later. China has become quite an economic powerhouse, with a tremendous effect on domestic urbanization and wealth, changing consumption patterns dramatically. So even if the country experiences short-term headwinds, we believe the long-term story remains slower, but stable. The important part is to look past the negative headlines to uncover the best opportunities, or as we like to say, "Follow the money!" At U.S. Global, we strive to follow the money by analyzing the broader Asian market, focusing on the areas that are sustaining leadership, both by sector and by country. 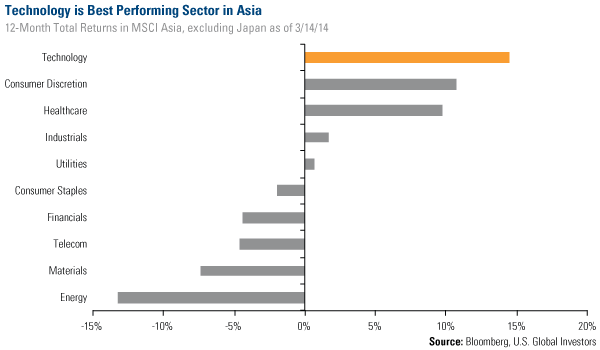 For instance, did you know that the strongest-performing sector in Asia over the past year is technology? Take a look at the chart below showing that technology stocks in the MSCI Asia Index (excluding Japan) increased 14.2 percent over the past 12 months. The sector far outperformed energy, which declined the most in the same time frame. In the Investor Alert, we've often discussed how the tech industry has been gaining strength in Asia, but particularly in China, which is quickly becoming the largest e-commerce market. 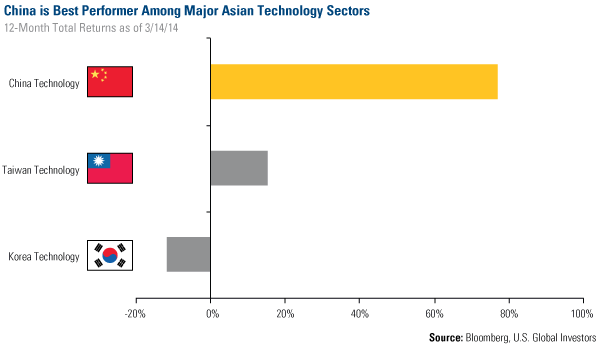 You can see below that Chinese technology companies have far outpaced other major Asian technology sectors. Over the past year, China's tech stocks grew 77 percent. In Taiwan, tech businesses rose 15.3 percent while Korean tech stocks decreased 11.6 percent. So what about China makes it a technology hub? Similar to what's happening in the U.S., mobile Internet is transforming consumer behavior in China, with further penetration of smart phones, proliferation of mobile-payment apps, and 4G networks rolling out in China. These technologies aid in the ease and pleasure of shopping from home and staying connected, facilitating the rapid adoption of mobile e-commerce in the country. 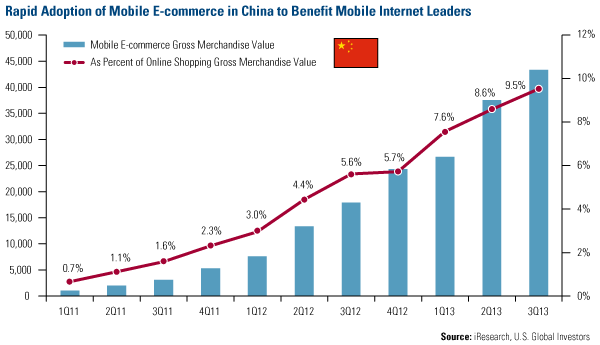 In fact, as of the third quarter of last year, mobile e-commerce transactions already comprised 9.5 percent of total e-commerce volume, up from just 0.7 percent in the first quarter of 2011. With this significant growth, what I think is really important in China these days is the entrepreneurial spirit taking place. You have these young entrepreneurs growing up in China, creating new companies and achieving incredible success. In fact, according to the Chinese government, the startup of new companies in the private sector increased 30 percent in 2013, reaching 233 million businesses! The entrepreneurs have government support too. 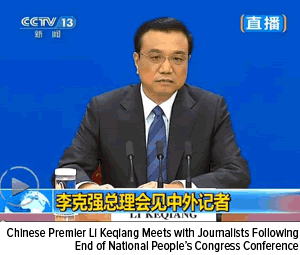 In the widely watched annual press conference following the end of the National People's Congress Conference, Premier Li Keqiang highlighted the government's focus on innovation as a key driver for growth. In his signature no-nonsense and candid manner, the premier restated the importance of modernization and advancement. As I wrote recently in my blog, innovation is one way companies grow and thrive in today's highly connected and competitive world. This innovation can be seen in the government's recent selection of technology companies, Tencent and Alibaba, to open private banks. Currently, almost all banks in the country are state owned. This is yet another positive for tech companies, who have already collected deposits from many smart-phone users, who are able to achieve better rates than normal banks can offer. When it comes to country leadership in Asia, Indonesia is topping the performance charts. Among Asian countries, Indonesia has been the best performing country over the past six months, increasing about 8 percent as of March 14. What is particularly impressive is that, despite investors' worries about the country's current account deficit and weak currency last year, businesses found Indonesia an attractive place to expand operations and do business. 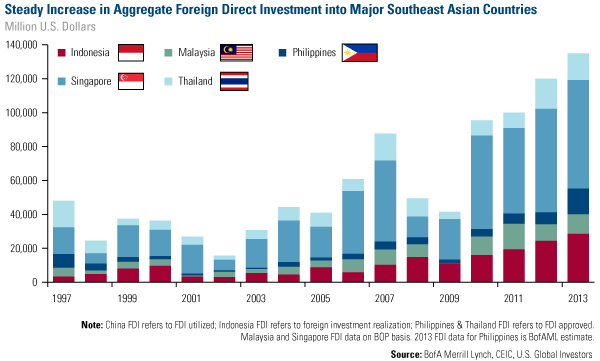 Aggregate foreign direct investment has been strengthening across Southeast Asia, rising 7 percent in 2013 to $128.4 billion. Foreign investment was a particularly bright spot in Indonesia, as it grew 17 percent, according to Bank of America Merrill Lynch. What's more, investment into Indonesia has been growing at a consistent pace over the past five years. This is a very encouraging sign, as there is great historical parallel, says Xian Liang, portfolio manager of the China Region Fund (USCOX). He says that in the 1980s and 1990s, foreign direct investment kept flowing into China, which helped the economy grow. Just last week, the country was upgraded to market weight by Goldman Sachs, which cited various reasons investors could see a pick-up in the investment cycle within the country. The country's current account deficit in the fourth quarter improved significantly. Indonesia managed to produce a trade surplus of $50 million compared to economists' expectation of a $775 million deficit. Indonesia inflation stabilized as November CPI was 8.37 percent versus the consensus of 8.45 percent. The country is getting ready for its presidential election on July 9, which could be positive for stocks. According to Goldman Sachs, "elections have historically been an important domestic catalyst" for Indonesia. In addition, depending on the outcome of the vote, pro-growth policies "could help boost investment activity and provide impetus to the overall growth cycle," says Goldman. Secular drivers remain intact for Indonesia. Younger demographics, lower labor costs, robust domestic demand, and rising geopolitical competition among superpowers should help sustain favorable investment cycles in Southeast Asia, especially in faster growing countries such as Indonesia. This is only a glance at some of the strengths in Asia where the China Region Fund is focused. With its ability to dynamically adapt and move to these areas, the fund can overweight these areas of relative strength while trying to avoid areas that have been under pressure. See how the fund has outperformed its benchmark over the one-month and one-year time frame by downloading the fact sheet here.